Starting on Feb. 8th — in just one week — we’ll acti­vate IPv6 sup­port auto­mat­i­cal­ly on all of your sub­do­mains. Let’s explore the changes you’ll need to antic­i­pate before you go for it (spoil­er alert: you don’t have to do any­thing on your side, as we’ll take care of every­thing). We won’t pub­lish a new post about what IPv6 is nor why it’s a good thing because oth­ers have done so in the past. We just want you to remind that due to the lack of IPv4 address­es, it was essen­tial to find a bet­ter solu­tion. However, the deploy­ment of IPv6 has been lag­ging and is flawed at some points. 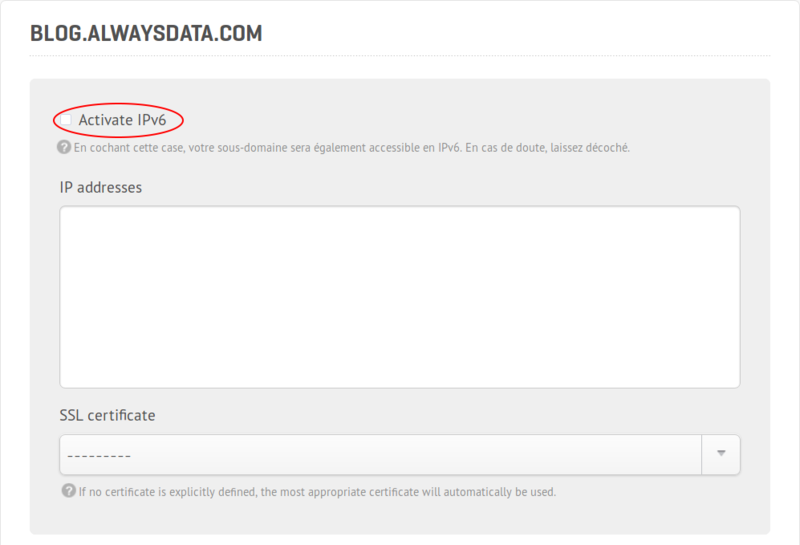 Yet, the rate of IPv6 among the main ISPs in France is still lim­it­ed. Worldwide sup­port isn’t nec­es­sar­i­ly bet­ter, with only 27% of web­sites acces­si­ble in IPv6. Reports pub­lished in December show that there’s still plen­ty of work to be done. We at always­da­ta have offered IPv6 sup­port since 2008, when it was a tech­ni­cal excep­tion for host­ing providers around the world. Based on our infra­struc­ture at that time, the qual­i­ty of ser­vice for IPv6 was mit­i­gat­ed, essen­tial­ly because we were rely­ing on anoth­er provider. Since we have now fin­ished our big migra­tion, we’re ready to give you even stronger sup­port for IPv6 by default, and we guar­an­tee our infra­struc­ture. This set­ting will now be removed, and your website(s) will be acces­si­ble under IPv6 with­out requir­ing any spe­cif­ic action. Technically, it’s only a DNS AAAA record that we declare auto­mat­i­cal­ly for all of your sub­do­mains. Please keep in mind that if you host your own DNS by your­self out­side of always­da­ta, you need to declare this AAAA record on your side to get IPv6 sup­port. The switch to IPv6 is trans­par­ent: if you get an IPv6 address from your ISP on your device, it will be used by default instead of IPv4, you’ll get access to your ser­vices and web­sites with this address. So, I do nothing. That’s it? The only excep­tion is for your web apps. If your app tracks your users by record­ing their IP address (e.g. in a data­base), you should check that your app is com­pat­i­ble with IPv6: the string length is dif­fer­ent for IPv4 and IPv6, so you may not record the IPv6 address cor­rect­ly. Otherwise, there’s noth­ing that you need to do. First, it’s a solu­tion for the lack of IPv4 address­es, which is a must, as we have clear­ly been out of stock for a while. Then, due to the dif­fer­ences between IPv4 and IPv6 pack­et head­ers and the qual­i­ty of con­nec­tion pro­vid­ed by IPv6, (large­ly because it doesn’t need sys­tems like NAT to deal with the reduced IPv4 address space), we can get a slight per­for­mance gain on web appli­ca­tions. Are you telling me you built a Time Machine… out of a DeLorean? Go back to the past with our built-in Time Machine! 2019: more than ever here to guide you! 2019 is run­ning on a rain­bow 🌈 ! Here’s why you must choose to join the @alwaysdata’s com­mu­ni­ty this year! Are you ready to rule the World? Wondering how to improve your com­mu­ni­ty? Here’s how to eas­i­ly dis­trib­ute your solu­tion to every­one!